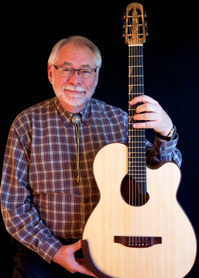 John has taught private guitar lessons since 1966 and has a lifetime of skills and wisdom to share. He is a world-class, enthusiastic teacher of fingerstyle guitar who can guide you through the maze of learning the art form. John teaches solo and accompaniment playing and covers styles ranging from Chet Atkins to jazz, folk and country to the bossa nova, gospel to – well, you name it! John listens to what you want to learn, finds where your musical tastes lie and prescribes the lessons in an order that fits you. And, when the situation calls for it, he writes specific arrangements for you on the spot (a skill that is marvelous to behold). John is well known for his arranging skills and has written over 800 TAB arrangements to date. He uses these arrangements as lessons. Each song has a particular style, difficulty level and a set of techniques, skills, and music theory knowledge needed to play them. John teaches students all over the world via Skype on the internet. Each lesson is 50 minutes long and the cost is $50 per lesson. Lessons can be booked weekly, every other week, monthly – however you’d like to do it. Having some sort of regularity and frequency is advised, but John will work with you however you want to handle it. John is available to teach lessons Mondays through Fridays from 8:00 AM to 4:00 PM (Pacific Time). Openings vary continually, so booking a specific lesson time and date has be done via email prior to purchasing lessons. If you are interested in learning more about online lessons, how Skype works, or have other related questions, please contact John. He will be happy to answer your questions, set up a phone call if desired and talk you through all the possibilities! From there you can set up a day and time for the first lesson. Once you have contacted John and have a set lesson time agreed upon, simply purchase your lesson(s) below. You will be taken to a secure page where you can process your order. After you have submitted your order, you will receive an email confirmation and John will schedule your lesson(s). "Taking Skype lessons from John has turned out to be one of best guitar decisions I have ever made. Improving my playing while playing the style of music I enjoy is a big plus. John is a genius at giving me arrangements of the songs I want to learn. I would have never dreamed that I would be able take lessons from a world class finger style guitarist." - Larry G.